I was the lead designer on this project, working alongside my boss and the senior designer at CBS Sports Network. I was responsible for research, wireframing, and the final design. Following the CBS Sports rebrand, we were in need of a new logo and brand resources website. This website had to be easily accessible by CBS Sports sales, PR, and marketing teams. Our approach for this project was to design a logo resource portal that was fool-proof and easy for anyone in the company to navigate, with a minimal amount of clicks to get to the logos they need. Each of the three core brands (CBS Sports, CBS Sports Radio, and CBS Sports Network) served as the top-level of navigation, with CBS Sports serving as the primary brand. The top portion of the sitemap within the dotted lines designates the three core brands, which would represent three section pages of the website. Each section page would contain all the property logos of the brand. Since this website would mostly be used by the marketing team, our first step was to interview them. The team expressed their preference for having the easiest navigation possible, with the least amount of clicks. They did not want to use drop down menus for navigation. They wanted the download links to property logos always visible and easily accessible. Additionally, the website should be easy to manage, as logos change year after year and there are often last minute edits to logos. Another aspect to this design was that it should fit in with the new look of the CBS Sports Network website, following the rebrand. Overall, we were looking to create a simple yet flexible site with organized content that was readily available. Before jumping into sketching, I conducted a light amount of research as to how other brands organized their logos and resources. Some websites I sourced included Facebook Brand Resources, Instagram, WhatsApp, University of Arizona, University of Idaho, and University of Florida. I found that the collegiate websites especially related to our design needs, as they also contained a variety of sports and school logos that required organizing. Knowing that we were going to follow the visual design of CBSSports.com, we went straight to creating high-fidelity mockups of the website. The same fonts, color palette, CSS styles for links, rollovers and menus were applied. Our goal was to make this website to look like a seamless extension of CBSSports.com. In order to not overwhelm the user with too many logos and information at once, ample whitespace was included to keep the feel light and airy, while still maintaining the strong organization and visual crispness that is inherent to CBSSports.com. The top-navigation bar borrowed directly from CBSSports.com, with the dropdown featuring each of the core brands' properties. These links would anchor down to the property the user selected, which would then automatically open. Since the network logos are the most popular and most often needed logos, we placed them at the top of the page. The one color logos, rendered logos, and brand guidelines sections would always automatically be open. The user would have the option of closing these sections. 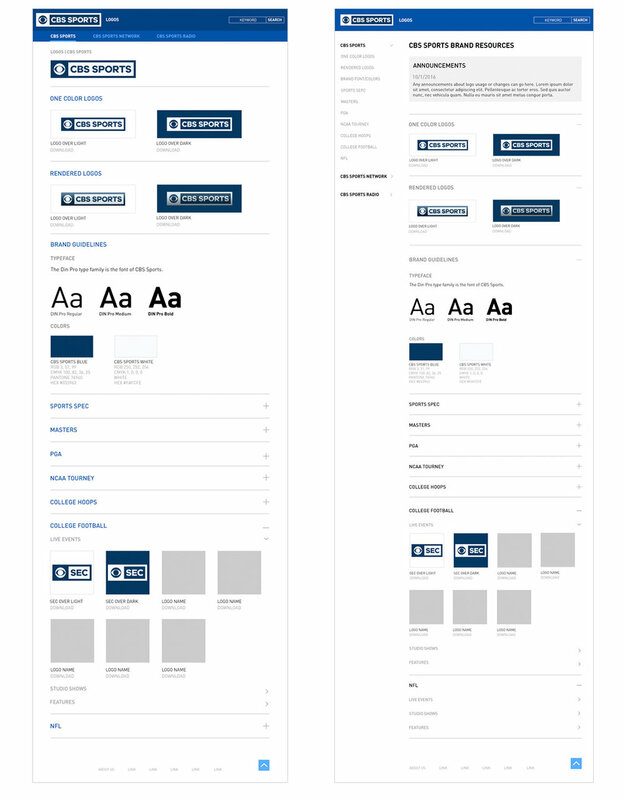 For the top nav dropdown menu, the top-level core brand logos were separated on the left from the shows and assets on the right. This would provide extra emphasis to these logos and the brand guidelines, which are arguably most important. A landing page was also created that could be used to post brand-wide announcements. Following the first round of high-fidelity mockups, we proceeded to the first round of feedback and revisions. Below is the final version of the wireframe that was sent to the developer. The mockup above was coded by the developer and sent back to us for testing. Should logos be organized by over light and over dark and have .zips that contain both jpg/eps or separate that out too? Working with the developer, we quickly turned around the revisions after our second round of feedback. The biggest addition was creating an option for a Share link. We also updated the top nav and the dropdown menu. The current version is below. Our next steps will be to continue testing and streamlining the website, adding meta tags for logo search, updating with new logos and assets as they become available, and developing a way to select and share a group of logos together as a single link.